Switchable between SD, HD, 3G and 6G-SDI. 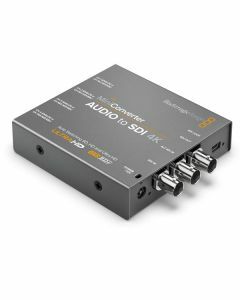 Auto detection of 4K, UHD, 2K, HD or SD-SDI inputs. SDI Auto Switching: Automatically selects between SD, HD, 3G and 6G-SDI. SDI Format Support: 525/29.97 NTSC, 525/23.98 NTSC, 625/25 PAL, 720p50, 720p59.94, 720p60, 1080i50, 1080i59.94, 1080i60, 1080p23.98, 1080PsF23.98, 1080p24, 1080PsF24, 1080p25, 1080PsF25, 1080p29.97, 1080PsF29.97, 1080p30 and 1080PsF30, 1080p50, 1080p59.94, 1080p60, 2048 x 1080p23.98, 2048 x 1080p24, 2048 x 1080p25, 2048 x 1080PsF23.98, 2048 x 1080PsF24,2048 x 1080PsF25, 3840 x 2160p23.98, 3840 x 2160p24, 3840 x 2160p25, 3840 x 2160p29.97, 3840 x 2160p30, 4096 x 2160p23.98, 4096 x 2160p24, 4096 x 2160p25, 4096 x 2160p29.97, 4096 x 2160p30.